"VAJJ" redirects here. For the euphemism used in Grey's Anatomy, see Vajayjay. Mumbai-Juhu Airport (मुंबई - जुहू विमानतळ) (ICAO: VAJJ) is located in Juhu, an upmarket residential suburb of Mumbai, India. It is used by small General Aviation aircraft and helicopters. Founded in 1928 as India's first civil aviation airport, Juhu served as the city's primary airport during and up to World War II. In 1948, commercial operations were moved to the much larger RAF Santacruz which was built 2 km east of Juhu aerodrome during the war. In 1932, JRD Tata landed at the Juhu aerodrome, inaugurating India's first scheduled commercial mail service. Today, the aerodrome handles all helicopter operations out of Mumbai. It also hosts the Bombay Flying Club and several executive and light aircraft and gliders. In 2010, the Airports Authority of India (AAI), which runs the airport, proposed to extend the runway 08/26 into the sea to allow larger aircraft to land, however permission for this was denied by the Ministry of Environment and Forests. With the New Coastal Regulation Zone (CRZ) rules of 2011 permitting roads on stilts, the Airports Authority of India announced in January 2012 that it would once again pursue its plan of extending the runway at Juhu Aerodrome into the sea. The aerodrome started off as an unpaved airfield in 1928. It was used by the then newly established Bombay Flying Club for teaching, joy-rides, and air travel. The activities of the club were limited by the fact that the aerodrome at Juhu was not suitable during the monsoon. Much progress had been made in the layout of the ground of the aerodrome by 1932, although the ground was still not fit for use during that year's monsoon. J. R. D. Tata, the father of civil aviation in India, made his maiden voyage to Juhu airport from Drigh Road Airstrip in Karachi, via Ahmedabad, on 15 October 1932 carrying mail in a Puss Moth aircraft. The Tata Airmail Service, as it was called, continued on to Pune, Bellary, and Madras. This was the birth of Air India, which, in 1932, was based here out of a hut with a palm-thatched roof and had 1 pilot and 2 apprentice mechanics with 2-piston-engined aircraft, a Puss Moth and a Leopard Moth. Two bitumen runways - one aligned East-West and the other North-NorthWest - South-SouthEast were laid in 1936. During the monsoons, operations had to be shifted to Poona due to water logging. A third runway was planned for construction in 1939 but this never occurred. It served as the city's airport up to and during World War II. Waterlogging during the monsoon and the absence of proper runways for monsoon take-offs were serious drawbacks for Juhu aerodrome. The former problem was addressed by replacement of the bitumen runways with concrete runways in 1937, while proper runways, night flying facilities, hangars, etc. were provided in the following year. At least two airlines were based out of Juhu during this period; Air Services of India, Ltd. and Tata Sons, Ltd. The airport served as the city's sole airport till Santacruz airport, now Chatrapati Shivaji International Airport (CSIA), was built in 1948. Santacruz airport is within a 2 km radius of Juhu aerodrome and this proximity of the two airports often caused confusion among pilots, leading to a permanent notice to airmen being issued by the Airports Authority of India cautioning that Santacruz's runway 09/27 should not be confused with runway 08/26 at Juhu. Juhu Aerodrome continued to be used however, such as by then Prime Minister Jawaharlal Nehru in 1948 as well as by the ailing Vallabhbhai Patel (then Deputy Prime Minister) who landed at Juhu in December 1950 to avoid large crowds that had gathered at Santacruz Airport to greet him. With air traffic congestion reaching an unacceptable threshold in Mumbai, the AAI put its age-old plan of reviving the Juhu airport on the fast track to ease some pressure off of Chhatrapati Shivaji International Airport (CSIA) in 2010. The AAI appointed consulting major KPMG to draw up a development plan for Juhu airport. It was envisioned that the Juhu airstrip could take up to 18% load off CSI Airport with turboprop ATR and Boeing 737 aircraft. The plan was to extend the runway to 2000 meters in phases, this would have ultimately seen the airstrip jutting into the sea and utilizing reclaimed parts of the Juhu beach and seafront. Permission for the expansion was denied by the Ministry of Environment and Forests in 2010. Instead, the ministry asked for conservation of the land around the airstrip, stating that no development should take place there and that it should be conserved as a green space to compensate for the pollution caused by the airstrip. With the New CRZ rules of 2011 permitting roads on stilts in CRZ-I areas (within 100 metres of the shoreline), the AAI decided in January 2012 to pursue its plan to extend the existing runway westwards from the current 1,143 metres to 2,020 metres by building it on stilts over the Juhu-Tara Road and into the sea, involving a capital cost of ₹2,000 crore. As part of the Rs 2,000 crore plan, the Airports Authority of India (AAI) wants to extend the main runway 650 metres into the sea while also realigning it to CSIA's Runway 09/27. The extension will allow aircraft like ATRs and Bombardier Q-400 to use the airport, while the re-alignment of the runway is required to allow for simultaneous operations of the two airports. The Juhu airport redevelopment plan, that received an in-principle nod from the State Government on 5 April 2013, involves closing down its secondary runway 16/34. Aviation experts have called the re-development blueprint most unsafe as closing of the secondary runway at Juhu would mean the airport would have to shut operations whenever CSIA uses its secondary runway 14/32. The use of Juhu's main runway, while CSIA's secondary runway is in use, will cause aircraft paths to intersect risking air safety. Airlines would be averse to operating from an airport which would either violate safety norms or be shut almost 40% of the time. Another technical problem facing the project is that the current runway is at an elevation of only four metres above the mean sea level. An extension of the runway into the sea would mean having to account for the sea level during high tide. Experts say the elevation of the main runway to about 12 metres above sea level would require the elevation of the entire airport, leading to flooding in the neighbourhood in the monsoons. The plan has also met with stiff opposition from local residents, who fear that the BMC's forty-year-old Development Plan (DP) that envisaged sports facilities, a recreation ground and two arterial roads would be shelved to accommodate the new airport. The re-aligned runway would also end less than a 100 metres from the gate of the 500-bed Nanavati Hospital disturbing patients. The extension of the runway is likely to divide the Iconic Juhu Beach that is visited by more than 10,000 tourists daily. The realignment will also require demolition of prime property in JVPD scheme and Vile Parle as some buildings are in conflict with the proposed realignment while other tall structures that will be an obstacle in the approach path will have to be lowered to one or two floors. Juhu has two operational runways and is run by the Airports Authority of India. It is used as a heliport for private charters and to ferry Oil and Natural Gas Corporation personnel by carrier Pawan Hans to offshore oil rigs at Bombay High. Jal Hans, India's first seaplane service was launched at the Juhu Aerodrome in December 2010. Juhu Aerodrome handles all helicopter operations, including private helicopter charters out of Mumbai. Due to congestion at the CSI Airport, in December 2010 all helicopter were moved to Juhu. The aerodrome can handle 6 helicopter operations at a time and currently handles about 100 helicopter operations a day. There is currently a plan to move all small private aircraft such as Beechcraft B-200 and Cessna C-90 operations from CSI Airport to Juhu Aerodrome to decongest CSI Airport. This was to take place by 10 January 2011, However, due to lack of infrastructure and security considerations, this has been delayed. As part of this move, the aerodrome is currently being upgraded to Instrument Flight Rules (IFR) from the current Visual Flight Rules (VFR). Currently the air controllers at CSI Airport have to align aircraft to the Juhu flight path using their radar before they hand over the aircraft to Juhu. The airport is also being fitted with a Precision Approach Path Indicator (PAPI) to facilitate night landing facilities that have been demanded by helicopter operators. There is also a plan to align runway 08/26 with runway 09/27 of CSI Airport to facilitate independent operations. While a new terminal building is being built to handle passenger movement, it currently only has a VIP terminal for private charter movements. There are also plans to extend the runway pending permissions. The airport is currently being guarded by the Maharashtra Home Guard who will soon hand over charge to the Central Industrial Security Force (CISF) that handles security for all major airports in India. A contingent of 174 personnel has been sanctioned for Juhu aerodrome with CISF infrastructure being accommodated in a renovated hangar. The CISF personnel will be armed with AK-47s and INSAS rifles. It will also have a vehicle-borne Quick Reaction Team (QRT). A perimeter wall is being built around the premises as well. The CISF personnel have however refused to take charge of the Airport security until a periphery wall is built. On 15 July 1953, a BOAC DH.106 Comet landed at Juhu Aerodrome instead of the much larger Santacruz airport. The aircraft was flown out some nine days later. On 24 September 1972, a Japan Airlines operated Douglas DC-8 landed at Juhu Aerodrome instead of Santacruz Airport. The aircraft overran the end of the runway and was damaged beyond economic repair. On 13 October 2006, a private five seater Beechcraft B 55 aircraft owned by Container Movement Transport Pvt. Ltd. crash landed at the Juhu aerodrome after experiencing engine trouble and losing radio communications. The aircraft, on its way to Vadodara, returned to Mumbai, from where it had taken off, and was badly damaged as it caught fire on landing. All passengers escaped safely and there were no casualties. On 28 Jun 2018- A UV Aviation Beechcraft King Air C90 crashed near Sarvodaya Ghatkopar in the Mumbai Suburbans during a test flight. Five people which included two pilots, two maintenance crew members and one passer-by were killed in the incident. Further investigation showed that the aircraft did not have the Certificate of Airworthiness. The aerodrome was used for the opening scene of Slumdog Millionaire and can be seen in subsequent scenes as well. Part of the climax of the 2008 film A Wednesday was shot here. The aerodrome was referred to as Juhu Aviation Base in this particular film. The climax of Hindustan Ki Kasam was also shot here in 1999. A scene from movie Zameen starring Ajay Devgan and Abhishek Bachhan also shot here. Movie Sab Se Bada Khaliadi starring Akshay Kumar was also shot on Juhu Airport. Mostly all climax scenes were shot here. ^ "Juhu airstrip to get a facelift". Rediff.com. 13 October 2007. Retrieved 10 February 2012. ^ At Juhu aerodrome VHF (very high frequency) communication exists at 124.35 MHz. ^ "Bombay Aerodrome at Juhu". Flight Global. 19 August 1932. Retrieved 16 September 2011. ^ "The Tata Airmail Service". Flight Global. 14 September 1933. Retrieved 16 September 2011. ^ "When air mail came to Madras". Madras musings. 1–15 November 2010. Retrieved 16 September 2011. ^ Pran Nath Seth; Pran Nath Seth; Sushma Seth Bhat (2005). An introduction to travel and tourism. Sterling Publishers Pvt. Ltd. p. 112. ISBN 978-81-207-2482-2. ^ Bepin Behari (1996). Astrological Biographies: Seventeen Examples of Predictive Insights. Motilal Banarsidass Publ. p. 341. ISBN 978-81-208-1322-9. ^ Stroud, John (1980). Airports of the world: Putnam Aeronautical Books. Putnam. p. 161. ISBN 0-370-30037-8. ^ "Juhu Improvements". Flight Global. 28 October 1937. Retrieved 17 September 2011. ^ "Airline Companies of the World". Flight Global. 27 April 1939. Retrieved 17 September 2011. ^ a b c "On a high". Indian Express. 10 June 2007. Retrieved 22 January 2011. ^ "WW II ghost over land near Sahar". Mid Day. 21 March 2011. Retrieved 28 March 2011. ^ "Disaster takes a stroll on our runways". The Indian Express. 12 April 1999. Retrieved 11 February 2012. ^ Nehru, Jawaharlal (1989). Selected works of Jawaharlal Nehru, Volume 6. Jawaharlal Nehru Memorial Fund. pp. 7, 8. ^ Panjabi, Kewalram Lalchand (1962). The indomitable Sardar: a political biography of Sardar Vallabhbhai Patel. Bharatiya Vidya Bhavan. p. 194. ^ "Juhu aerodrome to take load off airport?". Mid Day. 10 July 2010. Retrieved 23 January 2011. ^ "Navi Mumbai airport gets ministry nod". LiveMint (Hindustan Times). 27 November 2010. Retrieved 23 January 2011. ^ "Ramesh wants 380-acre open space around Juhu heliport". Hindustan Times. 24 February 2011. Archived from the original on 25 January 2013. Retrieved 7 March 2011. ^ "AAI looking to extend Juhu airport runway on stilts". Travel Biz Monitor. 13 January 2012. Retrieved 14 January 2012. ^ a b c "Experts: Juhu airport revamp model unsafe". The Times of India. 7 April 2013. Retrieved 10 May 2013. ^ "Juhu residents mull PIL against airport plans". The Times of India. 17 April 2013. Retrieved 10 May 2013. ^ "First Indian seaplane service takes off". The Economic Times. 28 December 2010. Retrieved 28 March 2011. ^ a b "Come Jan 10, small aircraft to fly from Juhu". Indian Express. 14 December 2010. Retrieved 22 January 2011. ^ a b "150 CISF personnel to guard Juhu Airport". MSN News. 5 January 2011. Retrieved 22 January 2011. ^ "Juhu airport to the rescue again, this time with parking bays for small aircraft". Indian Express. 17 December 2010. Retrieved 22 January 2011. 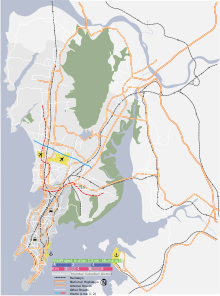 ^ "Runway 'overlap' delays shift to Juhu". Indian Express. 11 January 2011. Retrieved 22 January 2011. ^ "Plan to divert pvt planes to Juhu deferred". Hindustan Times. 11 January 2011. Archived from the original on 25 January 2013. Retrieved 22 January 2011. ^ "Stage is set for CISF to take over Juhu airport". Indian Express. 7 January 2011. Retrieved 22 January 2011. ^ "The Legacy of Douglas Corrigan: "Wrong Way" Landings By Commercial Airliners". Third Amendment. Retrieved 25 December 2009. ^ "Accident description". Aviation Safety Network. Retrieved 25 December 2009. ^ "Rs 200-cr plan for Juhu aerodrome, more if tunnel built". Indian Express. 5 February 2010. Retrieved 23 January 2011. ^ "Plane crash-lands at Juhu airport in Mumbai". Times of India. 13 October 2006. Retrieved 11 February 2011. ^ "Pvt plane crashes while landing at Juhu Aerodrome". Hindustan Times. 13 October 2006. Archived from the original on 29 June 2011. Retrieved 11 February 2011. ^ "Mumbai plane crash: Chartered aircraft crashes in Ghatkopar, five dead; black box recovered". The Indian Express. Retrieved 29 June 2018. ^ "Mumbai plane crash: Aircraft did not have a certificate of airworthiness - Times of India". The Times of India. Retrieved 29 June 2018. ^ "Slumdog Millionaire, India's Oscar Nod". Hollywoodtoday.net. Archived from the original on 26 February 2009. Retrieved 17 September 2011. ^ "The slumdog story". Livemint.com. 23 January 2009. Retrieved 16 December 2011. ^ "100 years of Bollywood: Movie magic in Mumbai". The Independent. 5 October 2013. Retrieved 8 October 2013. ^ "A Wednesday". Starboxoffice.com. Archived from the original on 1 April 2012. Retrieved 26 March 2011. ^ "On Location/Hindustan Ki Kasam". Indian Express. 23 April 1999. Retrieved 16 December 2011. Airport information for VAJJ - Mumbai, India (Juhu Aerodrome) at Great Circle Mapper. Source: DAFIF (effective October 2006). This page was last edited on 5 February 2019, at 04:32 (UTC).